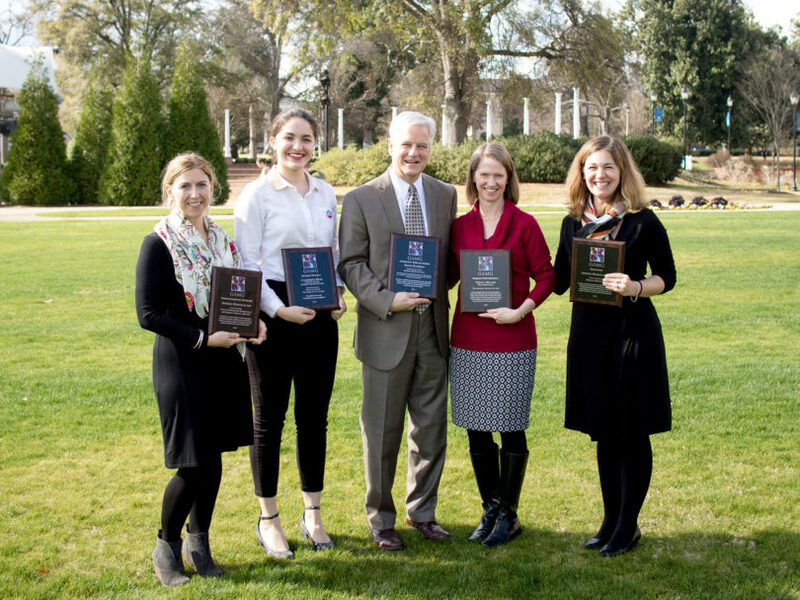 Athens, Ga. – The Georgia Association of Museums and Galleries presented the Georgia Museum of Art at the University Georgia with five awards at its annual conference, held in Augusta, Georgia, Jan. 18-20. The museum received the following awards: Education Program of the Year, Student Project, Exhibition of the Year, Community Service Award, and Museum Professional of the Year. Tricia Miller, the museum’s head registrar, received the Museum Professional of the Year Award. As head registrar, she oversees the museum’s permanent collection and all works on loan to about 25 temporary exhibitions annually. In 2015, she served as co-curator of an exhibition on museum practices (“Tools of the Trade”), and she has participated in state, regional and national organizations, making presentations at conferences and sharing knowledge with her peers. The Museum Professional of the Year award honors museum professionals who are professionally involved at the local, state and national level, demonstrate leadership in the profession and have worked to promote GAMG’s goals. The exhibition “Man’s Canyons: New York City on Paper” received the award for Student Project. Organized by UGA undergraduate student and volunteer curatorial intern Catherine Huff, it supplemented the larger exhibition “Icon of Modernism: Representing the Brooklyn Bridge, 1883-1950” with works from the museum’s permanent collection that showed New York City in the same time period. This award recognizes contributions of student work to the field of museums and galleries. “Icon of Modernism” received the 2016 Museum Exhibition of the Year Award (> $100,000). Organized by the museum’s curator of American art, Sarah Kate Gillespie, the exhibition focused on the Brooklyn Bridge as a symbol of modernity and included nearly 40 paintings, works on paper and photographs by major American and European artists, borrowed from private and public collections across the U.S. The award honors an exhibition that embodies scholarship, contributes to the cultural fabric of the state, and demonstrates excellence in expanding the museum audience. Volunteer David Matheny received the Community Service Award. Matheny has served in many roles at the museum over decades, including on the Public Affairs and Statewide Outreach Committee of its Board of Advisors and as a dedicated fundraiser. This award recognizes an individual who has actively promoted a community’s museum in ways that enhance its financial health, raise awareness of its benefits to the community and provide opportunities for growth of its mission. Finally, Morning Mindfulness, held every other Friday while UGA is in session, won Education Program of the Year. Morning Mindfulness, led by Jerry Gale, professor of human development and family science in UGA’s College of Family and Consumer Sciences, is a free guided mindfulness meditation session that includes an instructor-led meditation portion followed by a period of reflection. The Education Program of the Year award honors on-site or outreach programs that extend a museum’s mission while educating both students and adult audiences. GAMG is a private, nonprofit statewide organization dedicated to encouraging growth and improving professional practices of museums and nonprofit galleries throughout the state. Its annual conference, hosted by a different community each year, is an opportunity for museum professionals, board members, volunteers and supporters to share information and build relationships among Georgia museums and galleries. Partial support for the exhibitions and programs at the Georgia Museum of Art is provided by the Georgia Council for the Arts through appropriations of the Georgia General Assembly. The council is a partner agency of the National Endowment for the Arts. Individuals, foundations and corporations provide additional museum support through their gifts to the University of Georgia Foundation. The Georgia Museum of Art is located in the Performing and Visual Arts Complex on UGA’s East Campus. The address is 90 Carlton St., Athens, Ga., 30602-1502. For more information, including hours, see georgiamuseum.org or call 706-542-4662.